9ft Antique Snooker Dining Tables | Browns Antiques Billiards and Interiors. Welcome to our 9ft antique snooker diners page. 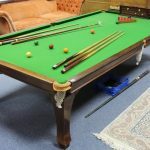 The 9ft convertible snooker dining table is a rarer size than the smaller tables, and makes a substantial dining table. 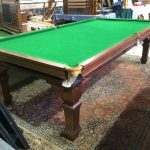 (We stock antique snooker dining tables in sizes ranging from 6ft to 9ft, please browse the other sizes too.) Please contact us if you would like to be notified when 9ft snooker diners arrive.